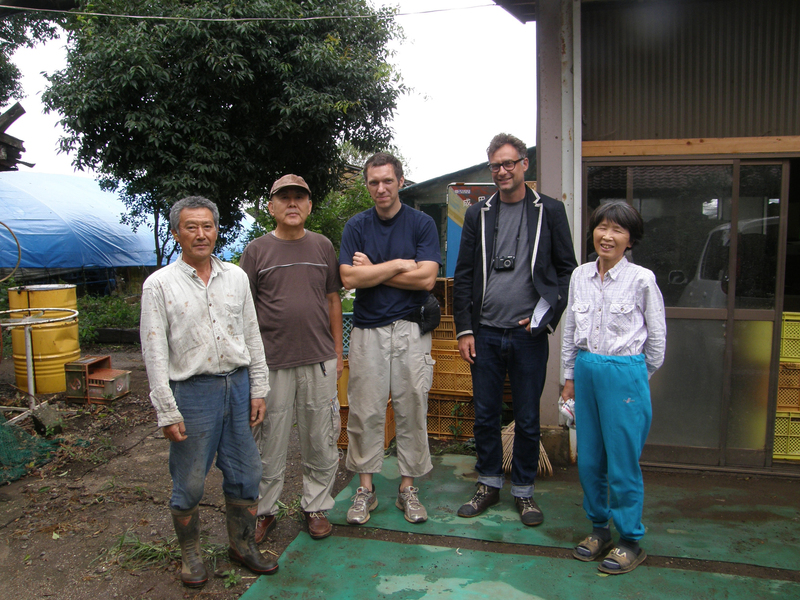 left to right: Shimamura-san, Hayashi-san, Rupert Cox, Angus, Fujiko-san. I am writing this post sitting on a spongy orange PVC sofa circling a fake marble pillar illuminated by scalloped glass and brass sconces in the lobby of our hotel. I am waiting for the washing machine to complete its cycle. Travelling to the farm every day is a very different experience from living on site in the building called the Egg House, as we did last year. In the autumn we were able to follow the patterns of activity on the farm: waking after dawn to film and record in the fields as the farmers harvested crops, returning to the Egg House for our breakfast when they themselves downed tools for a break. For much of the remains of those days we shadowed the farmers’ movements and even when we were elsewhere in the several hectares that comprised the farm, we could still see or hear them. In the evenings, I wrote entries on this blog, Matsui-san, Rupert and I would discuss things, we would back-up our files, listen and watch them (as rushes, effectively) and we would continue to encounter the farmers out and about. If not an intimacy, then we at least shared a sociability. While the farmers continue to be friendly, that connection hasn’t – from my perspective – been made again in the same way. Cooking food on the farm – often from boxes of vegetables grown on the farm itself that were donated by Fujiko – also, I now think, delivered a different sense of inhabitation, albeit provisional, than can ever now be possible as we shuttle back and forth. As strange as it may sound, given the inhospitality of the farm’s architectural and – primarily – acoustic surroundings, I realise today that we felt very protected there. We saw the airport security patrols, the blue riot police van with its red flashing lights, the police in the watch tower with their binoculars, but we saw them at a distance. We did have a couple of slightly testing episodes with the security around the farm but, tellingly, each occasion was one outside the farm’s perimeter (it had to be, of course, since we are working on private land at the invitation of the farmers). Once we were back on the farm’s terrain I especially – as the least robust one amongst us – felt a great sense of relief. I can clearly remember having gone for a walk to the combini (convenience store) one night and sighing out loud as on feeling the tension drop when I crossed the break in the trees just north of the main building that marks the beginning of the farm. This project would have been a very different one were we to have started it living off-site. As it is, I feel we have effectively been ‘formatted’ by the initial experience, absorbing an operational sense of the relationships that exist at the farm: of how the pieces of land attach to each other and what features (paths, distinctive trees, buildings, fencing, animals – both wild and cultivated) register those attachments; of how the farmers relate to each other and to the tasks the seasons and the produce require of them; and something of how the farm relates to the expanded sense of the airport. Whatever our living circumstances, our work this time would have always been different. Professor Hiramatsu has brought another dynamic to the situation, offering great insights for our understanding of the correlations between health and noise exposure; suggesting new approaches to the material; and guiding our thoughts outside of the farm towards other contexts in which it is situated: the fate of adjacent areas threatened by proposed runway expansion, the position of the local authorities in the area and the rival technologies (both technical in terms of hardware and conceptual in terms of metrics) involved in measuring the impact of noise. In the background this time, and also altering how we proceed, is a certain confidence in the audio-visual resources we have already accumulated. Being able to rely on these simultaneously offers a reservoir of things to try again and opens up new streams to explore.